Dorking Circular - Leith Hill (15 miles) 24km. This walk takes us to Leith Hill, the highest point in south east England. An area of woodland, parkland, farmland and open heath. 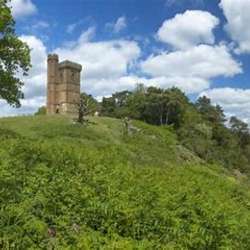 There is a tower with panoramic views across the Surrey countryside. Views include Sussex Weald, South Downs, English Channel & London. This is a circular hike and is approximately 15 miles. It should take around five hours. Please allow extra time for rest stops and lunch. After leaving Dorking we go on the Greensand Way. THE ROUTE CLIMBS CONSISTENTLY BUT FAIRLY GENTLY, until we get to Leith Hill. We will stop here briefly for our packed lunches whilst we enjoy the view. Our toilet/drinks stop is at The Plough pub in Coldharbour which is only 30 minutes away from Leith Hill. There are trains from London Victoria or London Waterloo to Dorking. Train fare - Please organise group savers amongst yourselves. You can post on the wall to show your interest. Drivers: For those who want to drive, there is free parking on Chichester road which is across the station. 2. Please note that hiking as an outdoor activity carries a risk of injury. When you RSVP, you confirm that you are in good health and accept this risk. 3. This is a hike only for the reasonably fit hikers or people that exercise regularly. Please do not RSVP if you are new to hiking or unfit. 4. Please wear walking boots or shoes. Preferably water proof. The paths can be muddy and slippery. This depends on the weather we have before the hike. 5. Bring a packed lunch and plenty of water. NOTE: I WILL BE MEETING YOU AT DORKING STATION. WEATHER: Please note that it might be necessary to cancel the hike if the weather is really bad. The hike should go ahead if there is little rain.